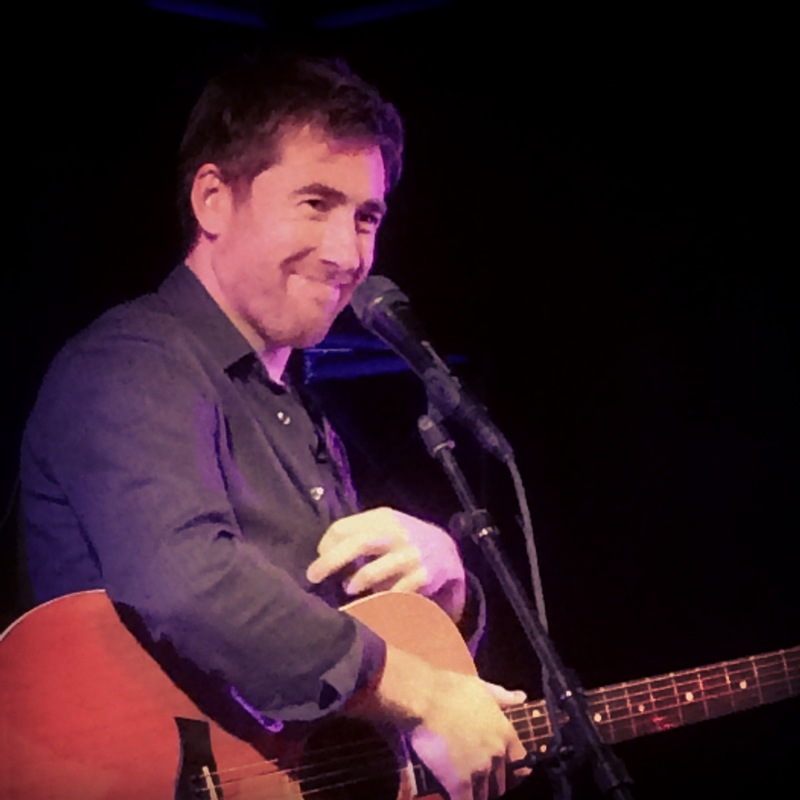 Jamie Lawson in Auckland, 29 August 2015 at The Tuning Fork. Image copyright Caroline Barron 2015. The young boy standing next to me hung close to his Dad, every few minutes pulling his phone out from his jeans pocket and checking the camera was ready. ‘How old are you?’ I asked him. ‘This is my first,’ said Isaac (as I learned was his name). We chat about first concerts. Mine was Queen at Mt Smart Stadium in 1985 (I’d just turned nine). Jeremy’s was the Eurythmics. Isaac’s dad’s was a punk band in a dive bar in London at aged 13. And now Isaac’s is Jamie Lawson at the Tuning Fork in Auckland. And the story gets even cuter from there. Isaac’s Dad slipped a note to the sound guy with the beard and the AAA pass slung around his neck. Isaac’s Dad won’t tell us what the note said. I wonder if anything will come of it. Thirty-nine-year-old UK troubadour Jamie Lawson does a stellar job entertaining Isaac (and the rest of us). He opens the sold-out show with the haunting and still ‘All is Beauty’ from the self-titled album due for release October 2015. He plays seven tracks from the new album, plus another that didn’t make it (‘If You Do’) and two from 2009’s The Pull of the Moon including one of my favourites, the very beautiful ‘Touch of Your Hand’. Lawson’s humbleness reminds me of Glen Hansard—fresh from the success of indie film Once—playing at the Civic Theatre March 2010. Three years later Hansard returned to play the Auckland Town Hall with a full band and a seasoned stage presence. 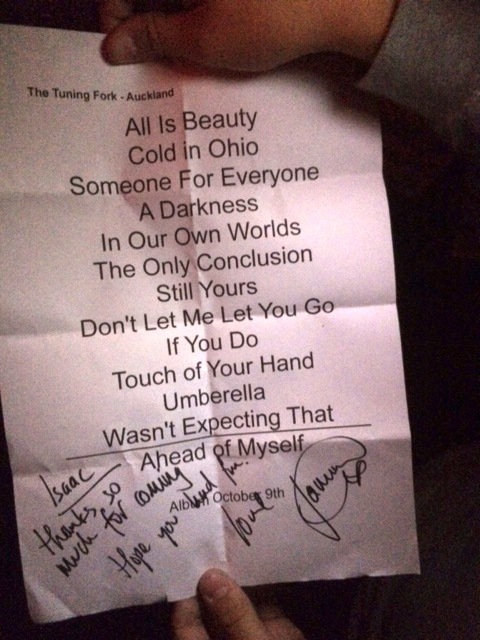 I suspect the next time Lawson plays in Auckland it won’t be at the Tuning Fork. Despite being English, Lawson has an Irish story-telling, heart-on-the-sleeve vibe. It is not surprising his earliest success came on the Irish charts—‘Wasn’t Expecting That’ reached number three on the Irish Charts way back in 2011. The song was rereleased in 2015 and reached number seven on the New Zealand charts, aided by Lawson opening for Ed Sheeran at Vector earlier in 2015. Tonight Lawson saves the hit song for second-to-last, the crowd singing every lyric. The encore, ‘Ahead of Myself’ had Lawson asking the crowd to join in and be his ‘horn section’, and seemed surprised when so many already knew this unreleased song. It was a brilliant night; Lawson’s voice soared and broke and creaked at all the right moments. I couldn’t get enough of the gap in his teeth that show when he smiled or sang a big note. The sound team at the Tuning Fork did a brilliant job, which almost made up for the venue’s inexperienced bar staff. Oh. If you are wondering what happened to our friend Isaac? I don’t know what Isaac’s Dad wrote on that note but it must’ve been pretty damn good. Half way through the set Lawson gave Isaac a shout out and, as the last song was sung, the guy with the beard and the AAA pass came up to Isaac, shook his hand and handed him a set list with a hand-written note from Jamie. Jamie Lawson—what a nice guy. Isaac’s dad—how you’ll ever top that I’ll never know. It was a great concert and a great experience.